Up on the blog today we are getting intimate with the Bedroom. Mostly because it's freezing here in Philadelphia but also because Bedrooms are the coziest rooms in the home. 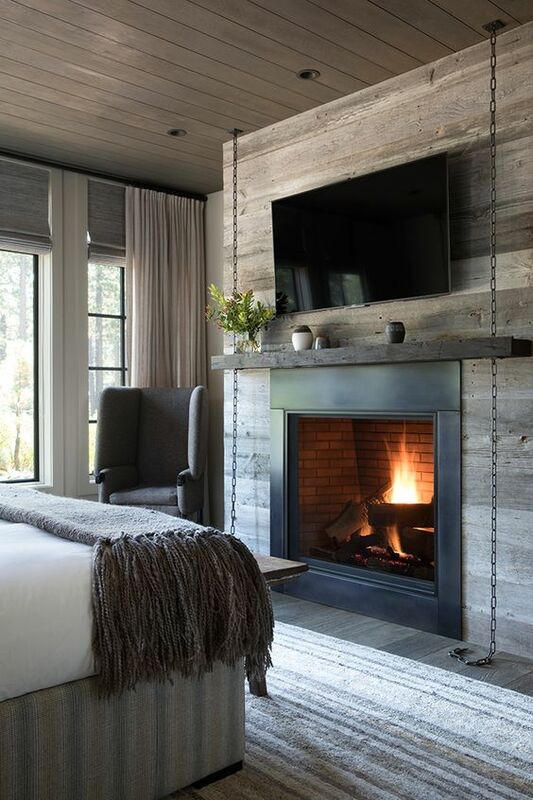 A bedroom should be a warm and welcoming retreat at the end of the day, and a fireplace is the perfect solution for turning a plain space into super cozy sleeping quarters. Whether you use it to add extra heat or just bring style and architectural detail, a fireplace instantly enhances a room. 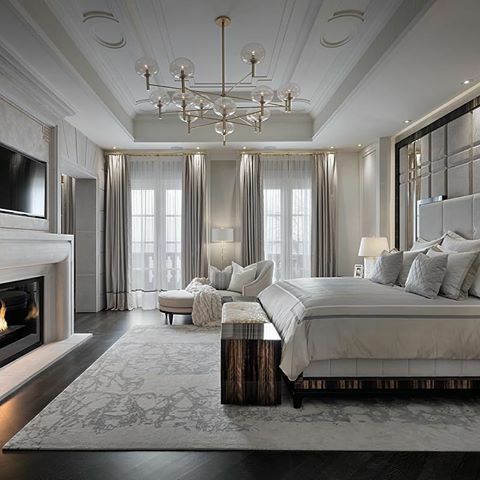 These interiors offer renovation ideas and Interior Design inspiration to show you how to incorporate a fireplace into your bedroom. 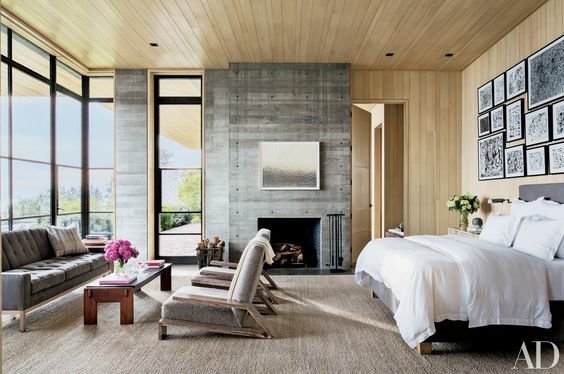 First up is this stunning bedroom in the contemporary Nashville house of philanthropists Jennifer and Billy Frist, photographs by Steven Klein and Sante D’Orazio grace the master bedroom, which features a sleek fireplace that we are drooling over. Next we have this gorgeous bedroom designed by Interior Designer Ferris Rafauli. This was featured in Architectural Digest. It is a sleek, sophisticated refuge with beautiful details. 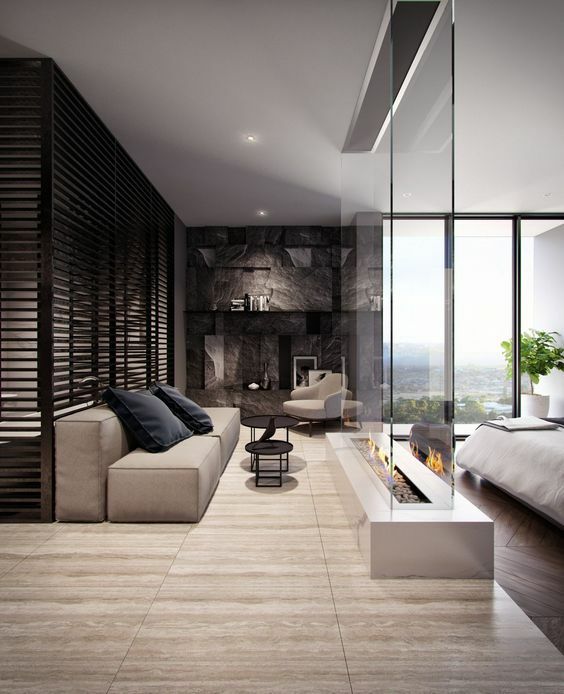 We really love this design idea of using a double sided fireplace wall to divide the sleeping and sitting areas. It's also very appealing with the muted colors and the architectural ceiling detail. This rustic option is a real dream for the Mountain Environment. Who says a white bedroom can't be cozy? This one is definitely on the clean but cozy side. This one is gorgeous. 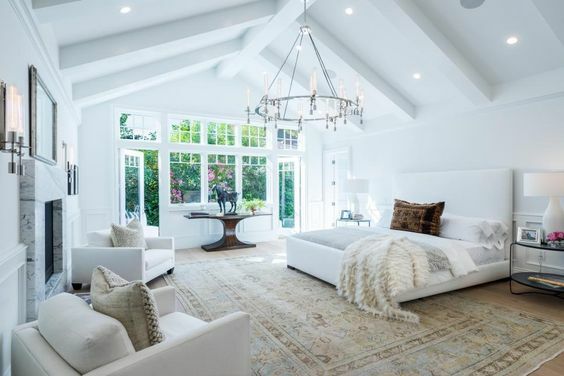 Also featured in Architectural Digest, this is the master suite of a Malibu home designed by Denise Kuriger, a Matthew Brandt photograph is mounted over the fireplace, and ink drawings by Van Hanos are displayed above the bed. Everyone has their own style when it comes to Interior Design. Of all the bedrooms we have featured here, this one is our favorite. It's clean, contemporary and luxurious. We hope that we have inspired you to not settle for less in one of the most important rooms in the house, even without the fireplace.